Wednesday July 14th 1909 Will went after the man to hang paper this morning to get the little room upstairs the hall and some closets done. I went in town at 2.12. took some work to Mrs Conklin to do for me went to the depot to see the folks start come back down for things needed and home at 4.30. Mr Merrifield finished the painting and I paid what I still owed making 33.00 for the work. 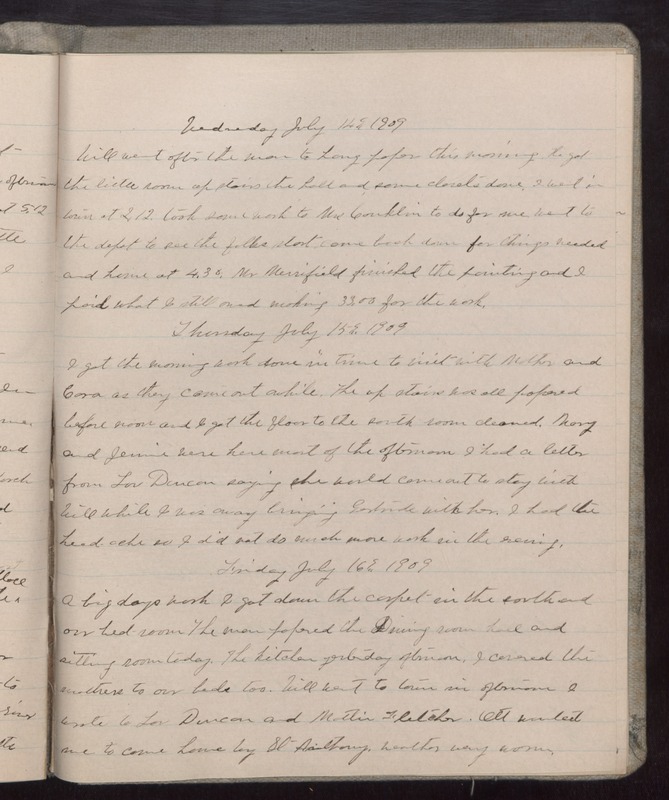 Thursday July 15th 1909 I got the morning work done in time to visit with Mother and Cora as they came out awhile. The up stairs was all papered before noon and I got the floor to the south room cleaned. Mary and Jennie were here most of the afternoon I had a letter from Liv Duncan saying she would come out to stay with Will while I was away bringing Gertrude with her. I had the head-ache so I did not do much more work in the evening. Friday July 16th 1909 A big days work I got down the carpet in the south and our bed-room The men papered the Dining room hall and sitting room today. The kitchen yesterday afternoon, I covered the mattress to our beds too. Will went to town in afternoon I wrote to Liv Duncan and [Matlin?] Fletcher. Ott wanted me to come home by St [Anthony?]. weather very warm.